Watch and listen to Tracy as she uses the mat's features to orient and align her body as she demonstrates the yoga pose: Half Locust. Video length 1:23. View Video. Watch and listen to Tracy as she uses the mat's features to orient and align her body as she demonstrates the yoga pose: Runner's Stretch. Video length 1:27. View Video. 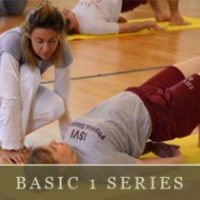 Watch and listen to Tracy as she uses the mat's features to orient and align her body as she demonstrates the yoga pose: Warrior One. Video length 2:03. View Video.